Note: This article was written two months before Benazir Bhutto's murder. Few Americans lie in bed at night mulling over the fortunes of Pakistan. This is a mistake. The sixth most populous nation in the world is the principle spawning ground for the Islamic jihad. By some coincidence, it's also the site of the CIA's second largest field operation (after Australia). However, the huge covert presence has yielded unexpected results. In 2001, a CBS News correspondent reported that on the day of the 9/11 attacks, Osama bin Laden was receiving kidney dialysis in a military hospital in Rawalpindi. For their part, conspiracy theorists like to point out that General Mahmoud Ahmad, who heads the Pakistani Inter-Services Intelligence (ISI), breakfasted with the chairs of the U.S. Senate and House intelligence committees on the morning of September 11, 2001. Two weeks earlier, these same three men met in Pakistan. An FBI document would later implicate General Ahmad in the wire transfer of $100,000 to lead hijacker Mohammad Atta. Then, on September 13th, the ISI chief left the United States with $10 billion in foreign aid. While Ahmad's connection to Atta did not merit a report on the evening news (or even a mention in Michael Moore's Farenheit 911), it's no big secret that Pakistan continues to house, feed and spawn ever more jihadists with every passing hour. Curiously, Pakistani President Pervez Musharraf claims in his autobiography that U.S. National Security Advisor Richard Armitage warned in 2001 that his nation would be “bombed back to the stone age” if he didn’t cooperate in the War on Terror. In reality, al Qaida has enjoyed the good life under Musharraf's reign. Much to the chagrin of the average Pakistani citizen, Musharraf signed a treaty ceding parts of the country's Northwest Frontier province to the Taliban and other al Qaida tribal affiliates following the 9/11 attacks. The fighters evacuated here and remained safely tucked away while the United States launched its Afghan offensive. Evidently, in order to keep up appearances, several hundred Islamic men were rounded out by Pakistani bounty hunters, then incarcerated in Guantanamo Bay. If you're wondering how it is that these men have never been charged or tried for any crime, this is probably why. Meanwhile, back in the Northwest Frontier, the real Taliban have been busy rebuilding their war machine in order to re-infilrate Afghanistan. By all accounts, the jihadists are poised to replicate the situation that exists today in Iraq. In addition to attacking NATO forces, they have turned a handsome profit on opium cultivation in the besieged country. According to a U.N. report, last year's harvest accounted for an astounding 92 percent of the world's heroin trade. Not bad for an army on the run. To be sure, from time to time Pakistan sends troops into the Frontier Province to combat the militants. But the soldiers involved in these campaigns are frequently captured, held hostage and sometimes beheaded. (In this respect, they seem no better off than Iraqi police trained by the U.S. military.) On October 8th of this year, General Musharaff's air force attacked an open-air shopping market and left dead 250 people, mostly civilians. Again, the Taliban themselves emerged unscathed, and now control the Swat Valley, just 90 miles outside Pakistan's capitol city of Islamabad (site of the CIA base). The valley was once a favorite spot for mountain climbers and other tourists. But no more. In spite of Musharaff's spectacular failure in putting ten billion U.S. tax dollars to good use, Secretary of State Condoleeza Rice and other State Department officials continue to tout him as an "indispensable" ally. Rice claims the general turned over Khalid Sheikh Mohammed and other senior al Qaida leaders to U.S. military authorities. Unfortunately, none of these men has been brought to the United States, charged and prosecuted for any crime, either by a military tribunal or civilian court. So their story has yet to be told. To date, only one mentally ill individual has been tried for the destruction of the World Trade Towers and part of the Pentagon. Against this unsettling backdrop, Benazir Bhutto recently returned to Pakistan. After spending eight years in exile, she's bent on running for a third stint as prime minister. She commands a significant following (in fact, most of the population), as demonstrated by the hundreds of thousands who flock to her public appearances. Still, it was a surprise to no one when two bombs exploded alongside Bhutto's welcome-home convoy this October 18th. Over 130 people were killed in the blast. Two weeks later, on November 4th General Musharaff declared a state of emergency, dismissing the country's judiciary and arresting thousands of opposition leaders, lawyers, human rights advocates and journalists. Citing the threat of Islamic extremists, he has also put Bhutto under house arrest. He has surrounded her family estate in Lahore with 1,000 policemen. In case you're wondering, the Bhuttos are a large clan that hail originally from the Pakistani province of Sindh. Benazir is related to the first king of the tribe, whose roots trace back to antiquity. Through the centuries, the family prospered by cultivating vast agricultural tracts along the Indus River. In 1958, some of the acreage was appropriated as part of land reform to help poor Pakistanis achieve self-sufficiency. The Bhuttos graciously surrendered it. It was her own father speaking. The nation he represented had been created less than two decades earlier, in 1947, from the carve-up of the British Empire. The Muslim half of Colonial India declared independence from the Hindus, creating the country of Pakistan. In 1971, Pakistan split again when the much-neglected, dirt-poor Bangladeshi people rebelled against the wealthier western provinces. The people of Kashmir, sandwiched between India and Pakistan, also aspired for independence, but India sent in troops to occupy the region in 1947. A promised plebiscite there was never held. Sixty years later, the Kashmiri occupation remains a source of tension between the two nuclear powers (and yet another breeding ground for jihadists). Gandhi had bestowed a huge gift on Pakistan, hoping to foster better relations in the future. And Ali Bhutto returned home a hero. But for the the assassination of Gandhi and the palace intrigue of Henry Kissinger, the ensuing decades might have turned out much differently than they have. The popular prime minister of Pakistan was a graduate from U.C. Berkeley and Oxford, one of the first men of his generation to study in the West. It didn't hurt that he married a savvy, cosmopolitan Iranian woman named Nusrat Isphahani, who gave him four children, two girls and two boys. Benazir was the oldest. One evening in 1976 her father confided to her that Kissinger had just threatened him during a state dinner. Bhutto was warned that if he didn’t cancel a contract with France to build Pakistan's first nuclear power plant, he would be made into a “horrible example”. 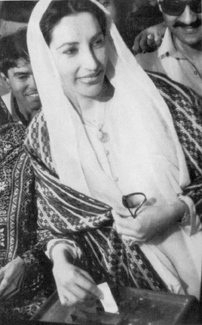 Those seven years Benazir spent in college included four at Harvard, where she graduated with honors. (Her father refused her request to attend U.C. Berkeley, explaining, ‘The weather in California is too nice. The snow and ice in Massachusetts will force you to study.”) She later became the first Asian woman to head the elite debating society at Oxford. In 1977, not long after Kissinger’s threat, Islamic fundamentalists in Pakistan accused Prime Minister Bhutto of corruption. Several PPP officials were assassinated and the mullahs (who were long-standing operatives on the CIA payroll) called for a general strike. The general public ignored the call, and voted for Bhutto and the PPP by a landslide in the next election. Kissinger now turned to Plan B. He had the head of the Pakistani army, General Zia ul-Haq, declare a state of emergency. Zia then deposed Bhutto in a coup. A former member of the Muslim Brotherhood, General Zia had close ties to the Islamic fundamentalist movement, which the CIA and U.S. State Department had been courting since the 1950s. At the same time the Ayatollah Khomenie was maneuvering to wrest control of Iran, Zia started implementing Sharia Law in Pakistan. In 1979, Zia executed Ali Bhutto after a sham trial in which Bhutto was accused of murdering a political opponent. The prime minister’s younger two sons had escaped before the army could detain them during the coup, but his wife and two daughters were thrown into prison. When the Reagan Administration took office in 1980, far from condemning the military dictatorship, it asked for and received permission from Congress to send hundreds of millions of dollars in foreign aid to Pakistan. The Soviets had occupied Afghanistan and a protracted campaign was deemed necessary to drive them out. Osama bin Laden flew in from Saudi Arabia to help set up the war’s staging area along the Afghan border. It was during this era that the ISI became what most Pakistanis refer to as "a state within a state", acting as the CIAs handler of the various Islamic factions fighting in Afghanistan. Benazir, meanwhile, languished in prison until 1983. Like her mother and sister, she was allowed to leave the country only when her deteriorating health caused a sufficient international outcry to force Zia's hand. Fortunately, the general himself would not live to reap the fruit of all his grim labors. In 1987, a mysterious plane crash left him dead, along with many of his top officers and the U.S. ambassador to Pakistan. Although the cause of the crash was never determined, by then Pakistan’s first free elections in a decade were scheduled. Benazir Bhutto returned from exile to run for the position her father last held. She and the PPP won easily and immediately assumed control of the parliament. On December 1, 1988, at the age of 35 she became the world’s first female prime minister of a Muslim country. Voting in the 1988 election. It's interesting to note that whenever Pakistan has been ruled by a dictatorship, money from the international banks and the United States has poured into the country like rain in Seattle. It's only when Democratic administrations have presided there that the bill collectors come to call. Benazir Bhutto faced this harsh political reality soon after taking office. With the Soviet pullout from Afghanistan, the CIA drew down its covert Afghan operation in Islamabad, leaving the new head of state in the position of having to pay back billions of dollars in loans made to the man who murdered her father. (In Liberia, President Ellen John-Sirleaf found herself in a similar position in 2006, when the banks demanded payment on loans made to the brutal dictator Samuel Doe and war criminal Charles Taylor. Sirleaf described that debt as “beyond the relm of comprehension”. See article. Although Prime Minister Benazir Bhutto attended a state dinner held in her honor at the White House, the first President Bush used the old “nuclear ambitions” excuse to cut off foreign aid to her administration. He even imposed economic sanctions. This was a bitter pill to swallow for most Pakistanis, given the blood, sweat and tears they had shed to help America win the Cold War against Russia. The relationship with the United States appeared to resemble that of Cinderella and her Stepmother, as Bhutto struggled to make the World Bank and IMF loan payments. In the face of austerity measures, Islamic militants now enjoyed a veritable recruiting bonanza. Islamic universities and training camps shot up along the border with Afghanistan. In 1990, after Bhutto failed to jumpstart the economy the country’s president, Farooq Leghari, dissolved her government with the backing of the supreme court. Wealthy landowners were accused of plotting against Bhutto for her efforts to institute another land reform to relieve some of the nation’s grinding poverty. In numerous press dispatches, Bhutto was described as both incompetent and corrupt. Not everyone, however, agreed with that determination. In 1994, as the head of the PPP, Bhutto was elected to a second term as prime minister. By then, the Pakistani ISI had created a new army of Islamic jihadists known as the Taliban, which means "students", along the border of Afghanistan. Outfiteed with shoulder-to-air missile launchers, AK-47s, and other high-tech hardware, the Taliban quickly subdued the army of the Northern Alliance and took control Afghanistan. Sharia Law was immediately implemented, including a prohibition on girls attending school. Incredibly, the United Nations recognized the Taliban government and provided economic aid to the new regime, even building a soccer stadium. The Taliban used the sports complex, not for soccer but to stage executions of political opponents. Back in Pakistan, Bhutto took a hard line on the extremists, shutting down the Islamic university in Peshawar and later handing over terrorist Ramsi Yusef to the FBI. Yusef was one of the planners of the 1993 attack on the World Trade Towers. During his time in Pakistan, the Blind Sheik, as he was known, tried to assassinate Bhutto twice. As in the case of her father, the Islamic fundamentalists failed to unseat her, thus leaving it for General Musharraf to depose her on charges of corruption in 1996. In 1999, the year before a U.S. presidential election, Musharraf deposed another prime minister, Nawaz Sharif. Sharif was a former supporter of General Zia. That's when Musharraf declared himself the head of state. According to some conspiracy theorists, this is where things get interesting. In 2001, according to FBI documents, the ISI's General Ahmad wired the hundred grand to Mohammad Atta, the lead hijacker in the September 11th attacks. On September 9th, Ahmad is also thought to have ordered the assassination of Shah Masood, the head of the Afghan Northern Alliance. (At the time, the Alliance was gaining traction in its effort oust the Taliban from Kabul.) Had Masood still been alive when the Americans invaded the nation in 2002, he would have almost certainly been elected the new president of Afaghanistan. Instead, a Unocal oil consultant named Hamid Karzai was installed after a fair and free election in which he was the only candidate. Karzai had no previous experience in public office. As tangential as all this may sound, Canadian economist Michel Chossudovsky says it proves the CIA was likely complicit or at least knew in advance about the plot to attack the World Trade Towers on September 11th. In fact, one of the two congressman who breakfasted with Ahmad that morning, Porter Goss, was later appointed by President George W. Bush to head the CIA. As for the Pakistani bounty hunters, the ISI is accused by Amnesty International of heading the effort to round up innocent Muslim in 2002 to form the roster of prisoners at Guantanamo Bay. A recent report from the agency states that the CIA paid $5,000 per head. “So it really worries me,” Bhutto explained to Margaret Warner of PBS this past August, “that there are all these people, from the top of my country right down to the shores of the Arabian ocean, who keep blocking the process of stemming terrorism." Lacking the votes in parliament to win a third term as president, General Musharraf met with Bhutto repeatedly over the course of a year to allow her back in Pakistan in return for the PPP's participation in the presidential vote in parliament that will give him another term. On October 5th, Bhutto’s party allowed the vote in question. While no one in the PPP cast a ballot for Musharraf, the party's participation provided the necessary quorum. The right-wing Islamic parties all boycotted. Bhutto subsequently came under fire from high-ranking members of the PPP for what was widely described as a power-sharing arrangement with Musharraf, one brokered by the U.S. State Department. Bhutto countered that the best way to transition to democracy was to ease a military dictator out of office, rather than throw down the gauntlet and risk substantial casualties. In an interview with the Washington Post, Council fellow Daniel Markey said, "She's playing a pretty dangerous game, with the potential that it could backfire on her." Bhutto has stated publicly that if she and the PPP take control of the parliament in January, she plans to order the country's armed forces to recapture all the territory taken by al Qaeda and the Taliban. She also plans to go after drug cartels directing the opium trade in Afghanistan. Most of these crime syndicates are headquartered in the Northwest Province and are thought to be providing the operating budget for the jihad burgeoning throughout the the Middle East and Central Asia. British military spokesmen claim eradicating poppy harvests would undermine the effort to win the hearts and minds of Afghan peasants, hence NATO's mostly hands-off policy concerning the drug cartels. A CNN report in October said only about 10 percent of the crops are destroyed each year per an agreement with the Karzai government. Bhutto told the Council on Foreign Relations audience that if elected, she will implement a recommendation by the ICG to more carefully regulate the public school system, banning sectarian, pro-jihad, and anti-minority teaching curriculums. Meanwhile, the role played by the U.S. State Department and CIA in Pakistan remains unclear. When Musharraf first moved to declare martial law on August 8th, Secretary of State Condoleeza Rice intervened and talked him out of it, according to news reports. In late September, Deputy Secretary of State John Negroponte was dispatched to Islamabad for a “strategic dialogue” with Pakistani officials. If the name Negroponte sounds familiar, this is the same gentleman who served as the U.S. ambassador to Honduras during the Reagan Administration's Contra war against Nicaragua. Truth commission inquiries into that dark episode from the 1980's revealed that Negroponte played a key role in directing the illegal mercenary group mounting attacks across the Honduran border. The raids resulted in mostly civilian casualties, included many rapes, kidnappings and the murder of an American electrical contractor named Ben Linder. When President Bush nominated Negroponte as his new Director of National Intelligence in 2005, several catholic nuns appeared at the confirmation hearing to vigorously protest the appointment. Negroponte was confirmed and today serves as the second highest official in the foreign service after Secretary of State Rice. All of which suggests that if anyone’s lying up at night mulling over the future, it’s probably Benazir Bhutto. Over the years, both her brothers have been murdered. Her husband, Asif Ali Zardari, was imprisoned for 11 years under Musharaff without trial. (The charges of corruption against both Bhutto and her husband have never been proven.) Benazir's three children have remained safe and are living in Dubai or London. Her eldest son attends Oxford University. From a commentary published in Slate Magazine, the month following the September 11th terrorist attacks. 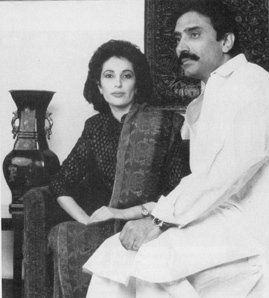 Bhutto, with her husband, Asif Ali Zardari, in 1989.